As a Bzzagent I have gotten to try some very fun products. I was so excited when I got invited to the Dr. Oetker pizza campaign. My family and I love pizza, both from a restaurant and frozen. I am always looking for new frozen pizzas to try and this one was a hit. Dr. Oetker pizza has been a favorite in Europe since 1985 and it has finally come to the USA. This pizza has a delicious crispy crust topped with very fresh ingredients for a frozen pizza. There are six flavors and my local Shop Rite actually had all six. The flavors are Mozzarella, Spinach, Funghi (mushroom), Quattro Formaggi, Vegetable, and Speciale (Pepperoni and ham). I have not tried all six yet but I did try three of them. We had the Mozzarella, Speciale and Spinach. I loved all of them as did my husband. My boys loved the spcial and mozzarella but left most of the spinach for us. 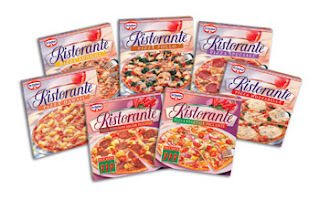 If you are looking for a new fresh tasting frozen pizza Dr. Oetker would be a good one to try.